Welcome to the QuasiTrad music events website. QuasiTrad was founded in 2014 by Judy Oleinikov to actively encourage participation in celtic musical traditions in Australia. Traditional celtic music in Australia is almost one of our best-kept secrets. You almost need to know someone in the circle to discover it, not because it’s elite, but because it’s niche. 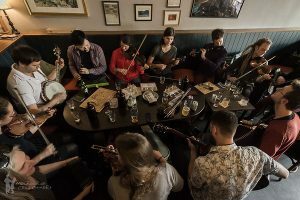 It’s not easy to find teachers and mentors in the genre, and many people live a long way from regular jam sessions or other celtic players. It’s a privilege for me to be able to help bridge this gap and to host events and tuition, and to be part of the small but steady folk music-and-dance revival happening here. I have a particular love for French-Canadian music which is lively and a lot of fun to play, and I particularly love to present this music, along with its Scottish and Irish music “cousins”, here in Victoria, Australia. The highlight of the Quasitrad calendar is the annual camp which brings some of the world’s finest traditional musicians to Melbourne for workshops and performances. 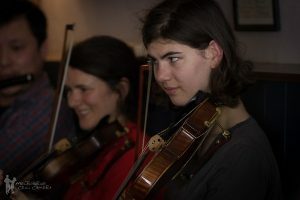 The camp honours the traditional way of learning music by providing a environment open to all players, teaching the music by ear and enjoying a great community atmosphere. You can also find out about traditional celtic music, in particular Quebecois music, and what’s happening here and around the world through the Trad Chat blog. – Jeanette Mill, dance caller, Canberra. Box Hill Community Arts Centre, 470 Station St, Box Hill. Dust off your instruments and come and join in a social jam session. Learn tunes the “traditional” way, by ear and by being part of a group. Suitable for musicians who can play a little already. We’re extremely excited to present Liz Carroll and Kate Burke as our guest artists in 2019. Liz and Kate will share their skills in the art of composing tunes. 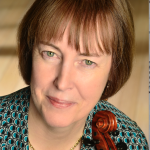 Liz Carroll (USA) is an Irish fiddler, composer, and recording artist. She is the first Irish-American musician to be nominated for a Grammy, and the first American-born composer honored with the Cumadóir TG4, Ireland’s most significant traditional music prize. 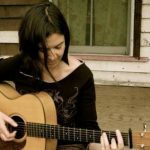 Liz has toured as a solo artist and with the Greenfields of America, Trian, as the duo Liz Carroll & John Doyle, String Sisters, and now as a duo with guitarist and pianist Jake Charron. She is featured on fourteen albums and has appeared on many more, and her duet album with Jake Charron, Half Day Road, has recently been released. Liz was born in Chicago of Irish parents, and still lives just outside her hometown. Kate Burke (Australia) has been composing, singing and performing as a multi-instrumentalist for many years, and has won much acclaim as a member of Irish / Australian traditional band Trouble in the Kitchen. Kate’s tunes and songs have won many awards, and have been performed and recorded by such artists as Muireann nic Amhlaoibh (Danu) and Tolka. A traditional session and whiskey tasting at the same time. Perfect! Other great sites for information on Quebecois and Australian fiddle camps & festivals, and more. • Hints & Tips & More!